Marvel Studios’ Captain America: The Winter Soldier has been topping box offices around the world since it was released in theaters! With his distinctive mechanical wings and great performance by Anthony Mackie, Falcon has left a strong impression among fans of the exciting movie! Today Hot Toys is thrilled to present the highly-anticipated 1/6th scale Falcon Collectible Figure. 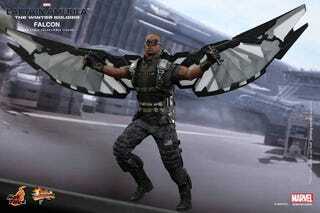 The movie-accurate collectible is specially crafted based on the image of Anthony Mackie as Falcon in the film and features a finely detailed costume, LED light up flight backpack, Falcon’s signature wings, weapons, and a dynamic figure stand perfect for flight poses. Fans don’t miss this opportunity to pre-order this high-flying ally of Captain America.